The summer doldrums have arrived. Officially giving me more time to catch up on the film I missed during the television season. However, with many upcoming off season series returning from their own hiatus, it might be tough to fit in a new show. 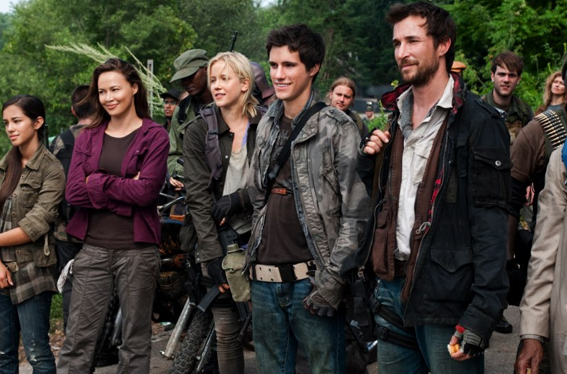 ‘Falling Skies,’ is definitely one to consider. Created by Saving Private Ryan scribe Robert Rodat and Steven Spielberg, ‘Falling Skies,’ paints a picture of the aftermath of an alien invasion. Starring Noah Wyle, Moon Bloodgood, Will Patton, and a handful of fresh faces, led by Drew Roy. Tom Mason (Wyle) is part of a group of resistance, fighting against the invading alien forces. Attacking humans in their various vehicles and “mechs,” the group is struggling to survive – being pushed westward, out of Boston, by the invading alien forces. Mason and his son belongs to the 2nd Massachusetts, who also lead and protect a group of civilians, providing structure in total anarchy. The first part of the pilot introduces us to a large ensemble cast, Weaver (Patton), is the commander of the 2nd Massachusetts, and it is clear him and Mason don’t see entirely eye to eye. Mason, with no personal military history is well read, a fact we are reminded of a little too often, but then again, this is basic cable, and we are only just meeting the characters. We learn that one of Mason’s son’s was lost to the aliens. Who seems to trap young humans, while killing everyone else. A detail that will most likely come to play later. The score featured in the pilot was excellent, and the production value is high for no doubt an effects heavy show – they’ve certainly put a lot of money into it, and it shows. Other effects heavy shows like NBC’s “V,” look pretty poor next to this one. The second half of the pilot takes some unexpected twists and turns, non-of-which I’ll hint at or spoil here, but it essentially ensures that I’ll be watching the next episode. Wyle is a great lead, an actor I’ve always enjoyed all the way back to his early days. I think ‘Falling Skies,’ has a strong, but flawed pilot, however, the talent behind the show definitely is going to have me stick through to see what is next. Check out Falling Skies on TNT, Sunday, June 19th.